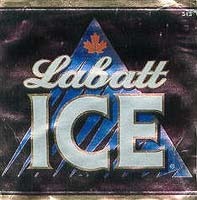 Cuando se elaboró por primera vez en 1993, la Labatt Ice fue la primera cerveza ice del mundo. Fue creada mediante un procedimiento singular, durante el cual la cerveza se enfría a unos -4º C, temperatura a la que se empiezan a formar cristales de hielo. Cuando se retiran esos cristales queda una cerveza suave y ligera. Como el agua se congela a una temperatura más alta que el alcohol, el contenido alcohólico de la cerveza aumenta. mediante una maduración prolongada se consigue una suavidad extraordinaria, y para obtener un delicado e intenso sabor a levadura se utilizan lúpulos selectos. Esta cerveza tiene un color amarillo pálido. Es del tipo Strog beer y tiene 5,6% vol/alc. y su temperatura de consumo tiene que rondar los 6ºC. Acompaña bien a platos de pollo especiados. 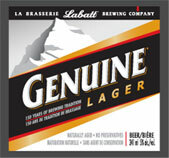 Originally introduced in 1992, Genuine Lager has evolved into a truly definitive Canadian Lager. Balancing a blend of quality aromatic and bittering hops with its medium body, Genuine Lager is a smooth, refreshing and easy-drinking beer with a subtle hop aroma and a hint of malty sweetness. John and Hugh Labatt, grandsons of founder John K. Labatt, launched Labatt 50 in 1950 to commemorate 50 years of partnership. The first light-tasting ale introduced in Canada, Labatt 50 was Canada’s best-selling beer until 1979 when, with the increasing popularity of lagers, it was surpassed by Labatt Blue. 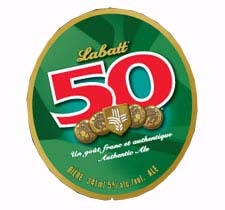 Labatt 50 is fermented using a special ale yeast, in use at Labatt since 1933. Specially-selected North American hops and a good balance of dryness, complemented by a fruity taste, provide Labatt 50 with all the distinguishing features of a true ale. 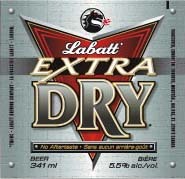 Labatt Extra Dry was the first national launch of a dry beer in Canada. Labatt Extra Dry is mashed longer than regular beers to leave less carbohydrate in the finished product, giving a lighter flavour with little aftertaste. Labatt Crystal was introduced to Ontario in the late 1800s as one of the first lagers brewed by Labatt. World-renowned Saaz hops are used to give this beer a clean, almost sweet taste which nicely balances the fuller body, higher bitterness and richer taste typically associated with traditional lagers. Pilsener-style Strong Beer, 6.1% alc./vol. Labatt Bleue Dry, the second addition to the Bleue family, is brewed with the same care and attention to detail as Labatt Bleue. Labatt Bleue Dry is mashed longer than regular beers to leave less carbohydrate (sugar) in the finished beer, giving a clean, crisp finish. Using select aromatic hops and a blend of the finest quality North American barley malts, this lager is clean-flavoured with no aftertaste. Labatt Blue Light was introduced in 1983 as a lower alcohol, lower calorie version of Canada’s most popular brand. Blue Light uses specially selected North American aromatic hops and the same strain of lager yeast as the one used to produce Labatt Blue. The result is a crisp, clean and delicately balanced beer, with a slight sweetness and citrus-like hop character. Genuine Honey Lager was introduced in 2005 in response to consumer demand for honey lagers. 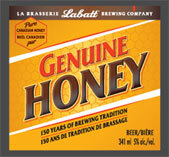 Labatt Genuine Honey uses genuine, all-natural, 100% Canadian honey to give consumers a softer, smoother taste. 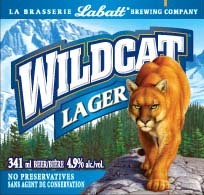 This naturally-aged lager is brewed to the same uncompromising standards applied to every Labatt beer. Genuine Honey Lager is the real thing! *Nordic is known by its original name, Labatt .5, in Quebec. Labatt Nordic was introduced in 1990 as part of an ongoing commitment to offering beer drinkers a sensible alternative. The use of a special brewing process allows Labatt to provide its consumers with a product with all the same great beer taste, but without the alcohol. This full-flavoured, low-alcohol beer is smooth-tasting, with only 80 calories per serving. 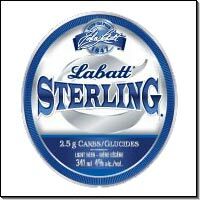 With only 88 calories per 341 ml bottle, Labatt Sterling is a light, refreshing beer with 1/3 less calories than regular beers. In other words, it's a great tasting beer...that won't slow you down.